Quilt by Artificial Intelligence? OMG! Today is just an ordinary Sunday around the Mosey home. We sleep in a little bit, take turns in the shower, get ready for church, drink way too much coffee, and pass the Detroit Free Press around the breakfast table, arguing about who gets which section when. This morning, an article in the Parade Magazine (April 22, 2018, page 9) really caught my attention. The article is called “Artificial Intelligence Takes Off.” Here are a few quotes from that article, but it would really benefit you to read the entire article if you can. The link is provided above. Let’s relate this article to what is currently going on in the world of quilts. Over the past few years, there has been a large quilting shift taking place around the world. Quilting used to mean one or more ladies sitting around a large quilting frame, stitching and talking and talking and stitching… stitching by HAND, that is! But the past several years have seen women AND men* sitting around a quilt frame to sew, or sitting by themselves and stitching by hand… AND sitting or standing by yourself to machine quilt a quilt top which you put together by machine. More recently, what I have noticed is more and more people who are “QUILTING BY CHECK.” The phrase “quilt by check” started out as a bit of a giggle… people who didn’t have the time to quilt would make their own quilt top, and then PAY a machine quilter to machine quilt the quilt sandwich together. I’m not saying that paying someone to machine quilt for you is necessarily bad. There are many people who earn their living by machine quilting for others who may not want to quilt for themselves. They may have a full-time job of their own and don’t have the time to quilt a top by themselves. They may not have the confidence to quilt by hand or machine on their own. A few years ago, I made my granddaughter a quilt for her twin-size bed. I was working full-time, and part-way through making the quilt top I realized that there was no way the quilt would get finished before Christmas, which was when Santa Claus would be delivering her quilt. So I utilized the service of a machine quilter from our quilt guild. I gave her the top, the batting and the backing for the quilt, and she let me know when it would be finished. A few weeks later, I received a call from her: the quilt was ready to be picked up. I prepared myself to cover my expense for “QUILTING BY CHECK,” and drove to her house. I was shocked to see her studio… she had several long-arm quilt machines in her basement studio. Two of them completely gob-smacked me!!! Not only were they expensive long-arm quilting machines, but they were computer-driven! In other words, the three layers of the quilt (top, batting and backing) were spread out on the machine. The computer was programmed, the thread was fed to the machine, and off she went.,, the machine sewed what the computer told it to sew (a specific pattern/design). When it ran out of thread, the machine alerted the human, and the human fed the machine more thread. When the machine had finished its job, it let the human know, and the human turned off the machine. The binding was stitched and sewn into place by the human, and the quilt was FINISHED! The human was given a check, and off I went with my head spinning. Let’s get back to the article above on Artificial Intelligence. As quilters, just how far will we let this “quilt by machine” era go? Yes, friends, I am a fairly loyal hand quilter. I enjoy doing handwork. I like to hand quilt, to hand applique, to hand embroider, etc. I love looking at old, traditional quilts, and I could sit hour after hour inspecting the work of those quilters who came years before me. What I’d like to know is this: where is the dividing line between hand quilting and Artificial Intelligence? Envision this: purchasing a large backing for a quilt top, a collection of fabrics that coordinate fairly well, placing it all into a plastic bag, handing it all over to a machine, selecting some electronic buttons that will supply the design for the quilt, pushing those buttons, and letting that sucker do its thing! Oh, please give me a class of cold water, a chair to sit in and something to slow my heart rate! I just don’t think I could do this! How many jobs will be taken away? Do you have room in your home for R2D2? I believe that time is coming! WHITE IS NOT WHITE, and WILL I EVER LEARN? Years ago, when my boys were young, I worked on this green and “white” quilt. Part way through the piecing process, I ran out of the “white” fabric. No big deal, right? White is white (or cream colored, in this case). So I hopped in my trusty automobile and drove to the nearest fabric store. I spotted some “white” fabric that looked the same, bought a few yards of it, and took it home to add to my quilt. The pieces were cut using the templates I had been using. Each evening, I would hand stitch a few blocks and add them to the quilt. Much to my surprise, when I finished the quilt and lay it on the floor to admire, I nearly fainted. The “white” fabrics were not all the same! Though the newer fabric I had purchased and added into the quilt was Okay, it was NOT THE SAME. In fact, it was drastically different! Well, I was not about to pull the whole quilt apart, so I left it alone. When you stand away from the quilt, you can see the “slightly darker” pieces of “white” fabric. They stand out, but when you are close to the quilt, you can clearly see the difference. Jump ahead about 20+ years, and I’m working on a blue and white quilt. Hand piecing it, actually. I had several yards of white fabric, so no need to go purchase more. However, part way through the piecing, I realized I just might need more fabric for the borders. So off to JoAnn Fabrics I go. Purchase the white fabric, take it home and sew it into place. Yup. You guessed it! When sewn into place, the whites are NOT the same. What I had most recently purchased was not the same quality fabric. Yes, it was white. And when you hold up the two fabrics together, they are so very similar. But not the same. One fabric has no polyester in it. The other has a smidge of polyester in it, blended with the 100% cotton. Now, who would think a SMIDGE of polyester would make a difference? Huh? Oh goodness, I’ve gone and done it again! Yes, I can see the difference. And not only that, I can FEEL the difference when I try and quilt through it. When you stand back from the quilt and look at it, everything looks fine. But when you get close to it, it’s quite apparent. UGH. Shoot me now. Please. And don’t ever try this on your own. You will regret it. 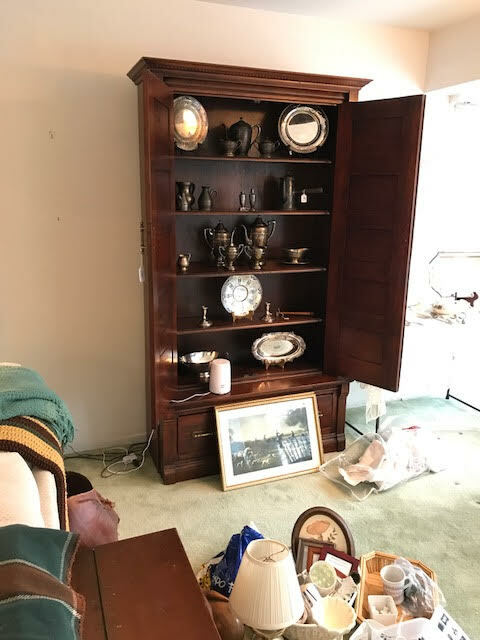 Today marks an important day in my family, as we hold an estate sale for my parents. My mother has been gone since 2007, but my father is still alive, though he lives out of the area now. At age 95, he needs a lot of assistance, can’t hear very well, and does a lot of sleeping. For the past several months, we’ve been making arrangements for the sale, and it just hit me this morning that everything in the house that we normally see… and have seen daily for years… will be disappearing one-by-one. That’s a strange feeling. There are some things yet in the house that Dad has asked that we ship to him, and what he wants are strange items. I’m wondering what he will do after the sale when he remembers something else that he wants… but that is no longer his? Preparing for the sale has also caused me to think about our own objects and what will become of them when we’re older. In my mind, I know who I want to give certain quilts to. But what about all the fabric, sewing items such as my good Gingher scissors, sewing machines, etc.? I guess it’s not wise to sit and think about all of this, but it is difficult NOT to! Do you have a plan in place for your sewing collection of stuff? What will you do with it? Do you know who will get it? Have you seen my phone? Do you know where I last put it? I swear that phone has feet and walks away all on its own! If you should find it at your house, would you please let me know? It has a Kate Spade cover with black and white stripes. I think I look for that phone at least 10 times every day. Wait… you too?!? It is said that as you get older, it gets harder and harder to remember things. Boy, isn’t that the truth! My Dear husband watches Jeopardy almost every single night. I sit beside him as he answers almost every question, and I am baffled at the memory this man has. How does one do that? They also say that it is important to keep your brain active and try new things. Hmmm… I enjoy reading, and I try as best I can to challenge myself to read more. Hubby also does a large number of crossword puzzles. I’ve never been good at them. I am trying to teach myself how to use WordPress better. WordPress is a software program for blogging. I find it pretty difficult, so every day I’m attempting to learn something new about it. It’s a real challenge! Quite often I hear from other quilters who want a pattern for a quilt design. I don’t think I have ever purchased a quilt pattern. Normally, if there is a design that I like, I whip out some graph paper and attempt to create a “similar” design, but I really prefer to design something unique on my own… a one-of-a-kind design. I enjoy reading, and now that I have officially retired, I’m pushing myself to sit down with a book much more frequently than I have in a long time. I’m currently reading Mirror Image by Danielle Steel. What do you do to challenge yourself? Share it with us! Maybe we can help each other! If you have joined an online quilting group using Facebook, you may have wondered why your group has rules and guidelines. Creating and running any kind of online group is time consuming. The more people that join a group means that the individuals who monitor and oversee the group have more work to do. 17,240 Members. Oh my goodness! Everytime a new member asks to join the group, someone (an administrator) has to check and verify that the new person either is already a quilter, has friends who are quilters, expresses a strong interest in becoming a quilter, and more (depending on which group it is. Checking all of this information takes time, and some of our administrators have families and/or work to deal with. Many groups have fun activities. 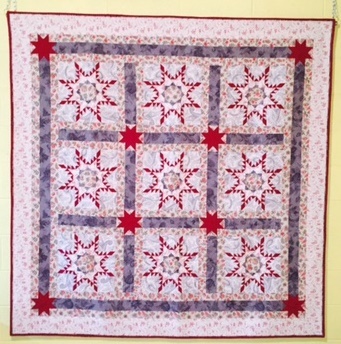 For example: Celebrate Hand Quilting has a weekly theme which is coordinated by Janet, one of our Admins. Each week, Janet comes up with a fantastic theme and posts the information for that theme online. One of our most recent themes was “SCRAP QUILTS.” So all of the members of the group got busy and looked to see if they have a scrap quilt that they have made previously OR they may contact any quilt guild members they know who has made a scrappy quilt. They may also decide that they want to make a scrap quilt of their own, so the weekly theme prompts them to begin their own NEW scrap quilt! What if a new “Member Wanna Be” asks to join the group BUT they have never quilted before, don’t know anybody who has hand quilted, don’t own a quilt, etc. Are they kicked out? That all depends on what group it is and what the guidelines of the group are. Most of the time we allow new members into the group but keep tabs on them for awhile. If the person shows great interest and starts asking some fantastic questions that new quilters would want to know, then they would probably soon be admitted into the group. SADLY, though, sometimes we get new members who want to be in a group, but all they want to do is argue about the rules, complain about a person in the group or about a theme, etc. One or more of the Administrators would more than likely review that person’s request and comments, and then decide that the group does not need a “Grumpy Gloria” or a “Crabby Craig” taking all the fun away. Thus, they would probably be removed from the group. Removing anyone from the group is never fun, and we don’t enjoy doing that. However, for the sake of ALL the members, it is sometimes necessary. Before you decide to join a group, PLEASE always take a few minutes to review the group guidelines. Read them carefully! If you have questions, contact one of the Admins and feel free to ask! We hope you make lots of new friends and learn a lot of new things! Caron prepares to hand quilt a new scrappy quilt! * Celebrate Hand Applique: This Facebook group was designed and founded by Caron Mosey. The group is all about doing HAND applique. If you love to do applique by hand or want to learn how, please ask to join this group and then share! Please do not request to join this group simply to promote products or long arm quilting services. The emphasis is NOT to promote quilt shops. *Celebrate HAND Quilting: This Facebook group was designed and founded by Caron Mosey. The group is all about doing HAND quilting. Yes, that means doing all those little stitches by hand, one stitch at a time, NOT by machine! RULE: 1.) This is a place for quilters to market/sale items that pertain to quilting, such as (Fabric, Thread, Quilts, Sewing Machines, Long Arms, etc.) No craft items please. 🙂 You may have up to 5 posts, and each post can have up to 10 items for sale it in. Please remember to delete your post when the items have sold. You may “Bump” your post once a day. Only the items you are selling can be in the photos ~ No warehouse type photos, or huge amounts of fabric, just the 10 items that are for sale. PLEASE remember to delete you post once it has sold. Also, posts that have been inactive for a few weeks may be deleted by admin. Albums are not allowed in this group. Please use the “Sell Something Tab” when creating your posts. This will make it easier for buyers to find your post. RULE: 2.) Please include the description of the item, including price and shipping cost or type of shipping used. PLEASE indicate if the fabric has been exposed to cigarette smoke, animals or perfume. Beginner LongArm Quilters: PLEASE NOTE WE CHECK EVERY REQUEST TO JOIN. You must answer ALL 3 questions to be considered. We are a LONGARM group, NOT for Domestic machines. You will be admitted based on what we can see from your profile: your quilting interests and groups and answered questions. eQuilter.com Caron has used this online source for many years. Please give them a try! You won’t be disappointed! How do you Kick your Quilting Drive into High Gear? I know we all go through those times where we just can’t figure out what it is that we want to do… Do I pick up a book and read? Do I take a walk? Knit? Sew? watch TV? Normally, I con’t have a problem with this, but I’m finding myself at home and wondering what to do with myself. I have a quilt to work on, however it just stares at me, and I stare right back at it. I have two furry kids who could always get more attention, I have television shows I could watch (but find boring), and I could visit a fabric shop nearby, but the only one close is JoAnn Fabrics. I’m sitting here twiddling my thumbs. Help me (and others) with some suggestions for getting our mo-joe going, please!